Ah, pitting Outlaws against fellow Outlaws are we now? What is this madness! So how powerful would you say magic is on the Mainland? I mean I'm not trying to raise the "Big Bad Skeli Armies of Chaos" here, just a few smoke and mirror tricks. Hi, I was just wondering, is there a size limit? Calculus3.14 wrote: Hi, I was just wondering, is there a size limit? Nope. If you read closely in the rules he said that there are no size limits. Build as big as your bricks will allow! For Phase 2 are we aloud to create multiple "scenes" in our MOC? 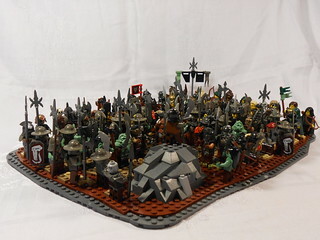 For example can I have one part of my MOC (one baseplate) show Loreos guards fighting some outlaws and then have another part of my MOC (a second baseplate) show my character 2 miles away fighting a different band of outlaws, as long as the two parts (baseplates of the MOC) are connected together and posted as a single image? If you think that you can pull it off, then go for it! That sounds like a great situation to maybe use some forced perspective as a possible option. Just an idea. Good luck! Hmmm... That is a little awkward. I'll talk to the other King's councilors and get back to you. Please do, as my character would most likely never defend the magical lands, and he probably would not fight the other three factions outright either as he has no beef with them. Like I said, he is most likely to team up with them to kill other outlaws of magical origins. Why can't he go attack the magic island on his own? No one says you have to be friends with outlaws just because you are an outlaw. That is his whole existence, basically what I planned for him. I just wanted to make sure it was cool that I attacked the islands too, even though I live on the islands. Everything's fair in war and war. Here's part 1 of my GC3 entry. Hopefully I'll actually be able to use/fit them all, as well as the opposing factions, in the next part. Entry for phase 1, cheers! This may be a dumb question, but where exactly are these Magic Isles? I'm looking at Mitah's fantastic map, and is it the island marked as 'Island of Lost souls'? I had intially thought we were invading the outlaw terroritory, due to the rewards. andhe wrote: This may be a dumb question, but where exactly are these Magic Isles? I'm looking at Mitah's fantastic map, and is it the island marked as 'Island of Lost souls'? I had intially thought we were invading the outlaw terroritory, due to the rewards. Yup, The "Magic Isle" is the same thing as the "Island of Lost souls". Various spooky names have been applied to it over the centuries. 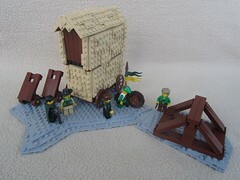 The main crusade is targeted at the Magic Isle. The "good" factions are trying to destroy the center of magical evil, which is based on the island.